I think this are great for the price, but I just dont have the room or money to add another line. Plus Mattel has a bad history of starting these lines and ending them way too soon. Does Mattel make Matchbox? I don't collect Matchbox so I don't know. This is the "Total Destruction Batmobile" from Mattel's new "Batman: Power Attack" series. If anything I would have expected it to be a Hot Wheel. So I guess the answer is that Matchbox is part of the Mattel group. I was in a store yesterday and did see the Mattel logo on the back. I guess I always thought of them as two separate companies and did not know Mattel had acquired them. To clarify a bit, Mattel got the Matchbox brand when they bought out Tyco. ^^ Thanks for the extra information, Jim. this may explain why we get no more Matchbox cars in Spain since Hot Wheels irrupted in the Spaniard market... I guess in this case Mattel decided to give priority to their Hot Wheels brand over the Matchbox one, which had more than 20 years of history in the Spaniard market (I have more than 200 Matchbox cars from my childhood). 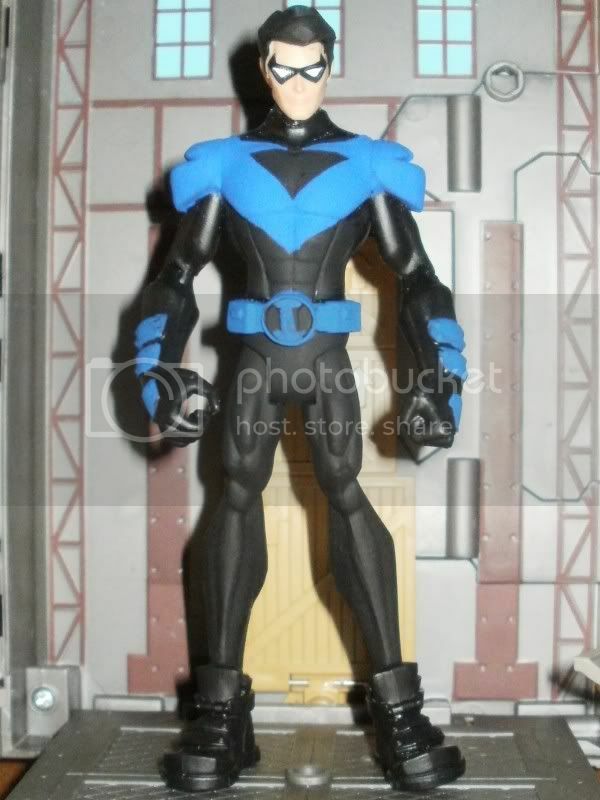 Here's a simple Nightwing custom I made out of an extra Robin. Just removed the cape, painted and shaved down the hair. I wanted to give him a set of Batman's legs for him to have boots, but decided I didn't want to spend $10 on another figure just to take it apart. Damn You customizers that are awesome at what you do.. I have some friends that are like this-- they dont see a figure for what it is- but for what it could become.. Damn PJ... that's the best figure in the whole craptastic line! i love it!!!!!!! can someone make one for me and a keaton batman colors version i.e all black, yellow logo and belt? I'd pay. 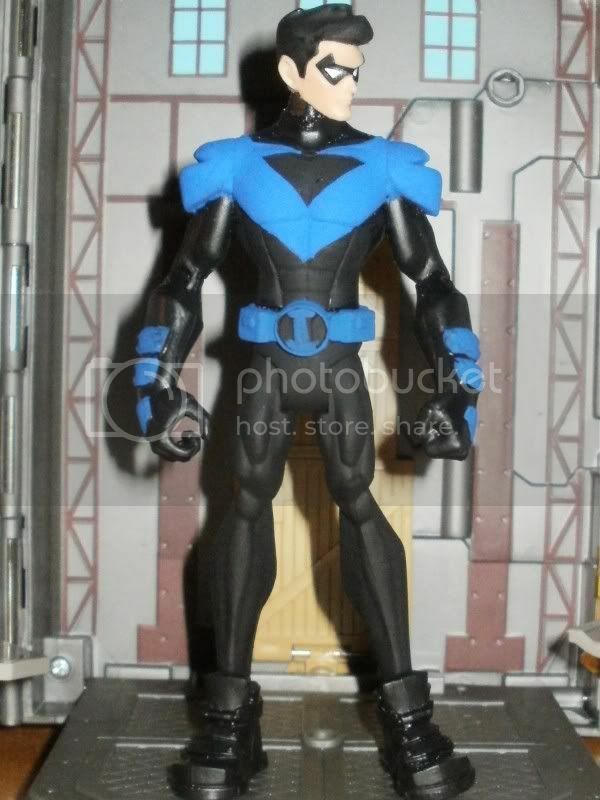 The blue paint in the belt and buckle and arm gauntlet looks a little rough not so clean lines but the pic is a bit blurry. Seriously customizers on this board pm me. I'd also like to see an arkham asylum batman the ones from the 2 pack with catwoman and is all white in the keaton colors as well. Oh the shoes look great this way!!!!! Fingers crossed we at least see Bane, Riddler, and Superman in the style. if they make them good, two face doesn't look that nice on the back of the card but who knows in person. This line is not selling. Everywhere i go i see full cases, they might have another YJ on their hands. Guess they were trying to fill the BB&TB void. Any big box wanting an exclusive in this line is going to regret it like i bet walmart is regretting YJ and the GL packs.